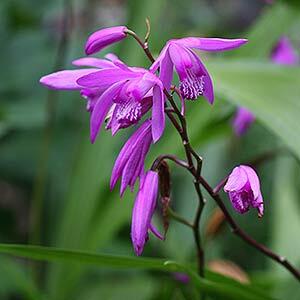 Chinese Ground Orchids or Bletilla striata are an easy care terrestrial orchid. They will quickly form large clumps in the garden in the right conditions. Flowering in spring through to summer, and generally tolerant of light frost, but not heavy frosts, Bletilla striata are a great addition to the garden. Originally from Vietnam through to China the actual bulbs sit at ground level. Strap like leaves reaching around 40 – 50 cm, with pretty rose colored or white flowers on tall stems. They seem to flower for a long period, and add some great colour to the garden over 4 – 6 weeks. 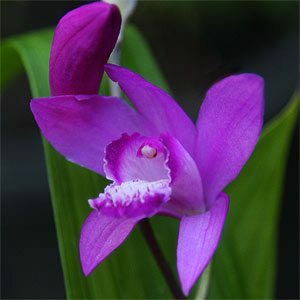 Chinese Ground Orchids are actually easy to care for in the right conditions. They prefer a humus rich moist soil, good sun to part shade is best for these low growing plants. However too little sun will inhibit flowering. A position where they will be relatively dry in winter, well drained and no extra water. We grow ours in the ground, near the front of the border. The soil is well drained and they flower reliably every year. Best grown in the garden in a humus rich well drained soil. They will come as a tuber and the growth spike should be apparent, this needs to be around 3 – 4 cm below the surface. Amend the soil before planting if drainage is poor. Both the purple flowered Bletilla striata and the white flowered Bletilla striata ‘alba’ flower during late spring to early summer. Chinese Ground Orchids are fairly easy to grow in the right conditions. Propagation by division of larger clumps when dormant, in late winter is best. Growing well in pots, they will also thrive in the ground given a warm sunny position.